Emily and Greg wed outdoors in a sweet garden wedding in Leesburg, Virginia. 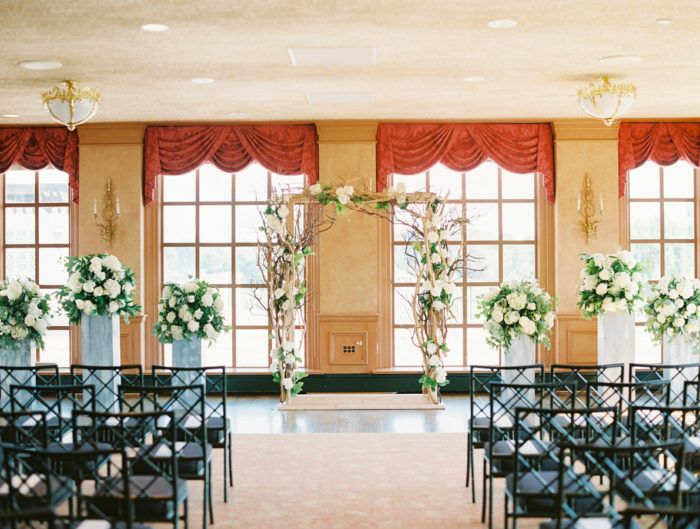 In case you missed their beautiful vows, be sure to check it out here. 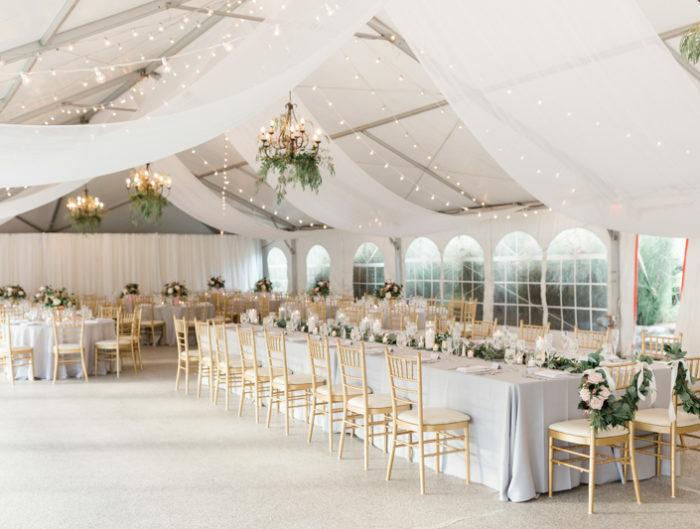 For their wedding reception, the couple opted to stay on property and move their group under a glowing tent to celebrate. And, celebrate they did! With lots of unique wedding details, like birdcage centerpieces and even a nod to their pup who couldn’t make the big day, Emily and Greg’s was a celebration full of personal (and pretty!) DIY wedding details. Their custom corn hole game made for great cocktail hour entertainment, but my favorite touch might be their rustic wedding cake adorned with beautiful fresh flowers! 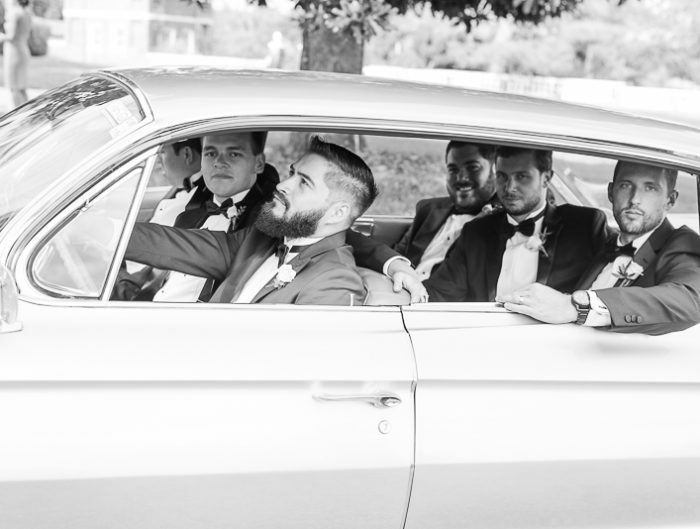 Clearly, a great time was had by all and we can’t thank Kim Newton Weddings and Jason Collins Photography enough for sharing Emily and Greg’s wedding in Virginia with us! From the bride: Thanks to the help of our talented family and friends, we had more handmade elements than I can count on two hands! The custom corn hole set, flavored Virginia peanut favors, linen table runners, programs, guest book, centerpieces, family photo display, hand-painted signs– and the DIY wedding project list goes on¦! Our only regret about our wedding day is that our dog Wiley couldn’t be there! We renamed the our signature cocktail The Minty Mutt (i.e. a classic mojito) in his honor. Dance lessons are worth it. Whether you are pros or you both have two left feet, there’s no better excuse to step away from your to-do list than to let loose with the one you love! All of the details and decisions of wedding planning can quickly overwhelm you if you let them- so don’t! While running various wedding errands, we made it our tradition to always stop for a Bloody Mary (or two!) on our way home to savor every moment of the whole experience. When it was time to start assembling wedding invitations and favors, I recruited extra hands by turning it into a crafts & cocktails party with all of my best girlfriends. You’re only engaged once, so make the most of it! If you’re on a tight budget, pinch your pennies early on. Costs start to rack up closer to the wedding, so avoid stress by building in some buffer funds for when you’re in the homestretch! Congratulations to Emily and Greg! Thank you for sharing your tented celebration with us! Hair Stylist + Makeup Artist: Jordan K. Winn & Co.